Positive Affirmations For Fertility: Affirm and Conceive! 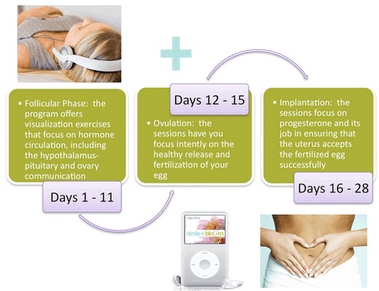 Positive affirmations will help you increase fertility and general well-being through relaxation. Using positive affirmations is a form of healing based on re-wiring your subconscious mind to new and more positive thinking while allowing the release old negative thinking. During your life you may have taken up negative thinking patterns based mostly on your fears, life uncertainty and discouraging experiences. These negative thoughts are now the cause of your mental and emotional blocks that might prevent you from allowing the process of conception to take place within your body. Positive affirmations are a great way to meditate and to bring a positive outlook back into your life. If you stop for a moment and think about it, you will notice that you already practise affirmations all the time. When you tell others that you are going to do something, you are affirming something that you intent to manifest into your life. In order for you to manifest an idea into reality, you first have to create a thought, then you have to express this thought either verbally or mentally in the form of a sentence or an image and then you have to choose the actions necessary to manifest it. Positive affirmations are meant to support you through the process of conception by helping you to release all the mental blocks that prevent you from truly manifest your desire to become pregnant and assist you to affirm positive and encouraging thoughts into action. The following positive affirmations for fertility can also be used in conjunction with healing gemstones therapy, which consists on placing specific gemstones in specific areas on your body while laying down and relaxing in a state of meditation. The following are positive affirmations that will help bring healing and balance in your physical body. New balance is coming to my body now. My reproductive organs work in perfect harmony with my body to allow an easy conception. Every time my period comes I rejoice in the fact that my body is functioning correctly. My hormones are perfectly balanced and my menstrual cycles are becoming more and more regular. My eggs are healthy and happy to be released during my next ovulation. I ovulate around day 14 and my fertility signs are very clear to me. At the mental level you often see how your mind introduced thoughts of worry, fright and insecurity that weaken your will and your hope for the future. Positive affirmations will help you increase mental strength and release old thinking patterns that no longer serve your life purpose. I trust and I love myself. I accept the gift of life within myself. I willingly release old thinking patterns based on fear and self-doubt. I allow new ones based on love and self-confidence. I now choose positive thoughts that nurture and support my life. I accept the responsibilities of motherhood (fatherhood) and I know I will rise to the occasion when the time comes. I am now a loving parent to myself. I focus on the power of now. I release fears about age and time. I set my worries aside and I allow my body to do its job. I surrender to the power of nature as I celebrate a new cycle of birth within myself. Positive affirmations are very useful in counteracting negative emotions that pull you down. Sadness is a very common emotion in couples who cannot conceive, but it can hinder your fertility. I now release all emotional blocks that prevent me from conceiving a baby. I now release all unwanted built-up emotional patterns that prevent me from connecting to my inner self. I am now becoming more and more confident about my ability to become a mother (father). I now release all my fears and concerns about infertility and I declare myself fertile. As my sadness lifts away a renewed sense of hope settles in my heart. I express my feeling and I share them with my partner. The following positive affirmations will help you and support you while you make the necessary life style changes to increase your fertility. I drink plenty of purified water every day. I am hydrated and healthy. I choose healthy foods every day. I now crave only foods that increase my well being. I am very energetic and I channel my energy in positive ways. I educate myself about a healthy pre-conception life style. I eat lots of fresh fruits and vegetables every day. I take natural vitamins and minerals my body needs to increase my fertility. It is easy for me to avoid alcohol, too much coffee and unhealthy food choices. I easily avoid hydrogenated, highly processed foods and I enjoy simple foods made by nature. I educate myself on the power of eating raw whole foods. I love my new healthy life style. Positive affirmations help you manifest into your life what you have desired for so long. It is time to allow the manifestation process to take place. The universal life force brings me new creative energy. I welcome my time to be a parent. I graciously accept my creative powers. I allow the creative forces within me to be released. I allow my creative energies to work through me and bring me a healthy pregnancy and baby. I deserve the best outcome and with joy I am thankful of a new life. I experience a profound connection to the miracle of life. I now manifest my decision to have a baby. I visualize having a baby. There is a subtle energy field that surrounds your physical body. This energy field is life giving and it is often referred to as the life force. Good health is achieved when the life force is balanced and allowed to flow freely. When it is blocked and unbalanced, it leads to dis-ease. The following positive affirmations are meant to assist your healing journey by using light and energy. If you like to use healing crystals, place a rose quartz crystal on your heart area. I allow the light to cleanse away all my fears, indecisions and concerns regarding pregnancy, delivery, and parenting. I allow harmonious energies to heal me in this very moment. I am open to new energies and I allow new life to enter my life. I visualize the color pink surrounding me and bringing me love. I now access my spiritual abilities and intuitive perception. Angels are part of the universal force of Love & Light as they are spiritual energy beings. You do not have to believe in their existence, you just need to be willing to ask for their help and support. You will be surprised how much love and light they can bring into your life. These positive affirmations will help you surround yourself to their love and healing energies. Expect miracles! I ask the angelic healers to remove any block that prevents me from getting pregnant. I surround to the healing forces of the universe. I ask Archangel Raphael to deeply heal my mind, body and soul now. I ask the Angels for guidance and protection every day. I am thankful for all I am and all I have. I am at peace. I am thankful to God and the Angels for their help, protection and guidance. I listen to my inner guidance and I act based upon my intuition. I listen to subtle messages that the universe is sending me so that I can find the right therapy for my case. I ask Archangel Michael to guide and protect me at all times. It is a good idea to practice positive affirmations while you meditate. relaxation breathing is a great technique to use while relaxing in meditation. You can also say your affirmations out loud by looking in the mirror or you can write them down in your journal. I sometime like to send myself an e-mail containing affirmations I know I will need to read at a later time. The choice is yours, but most of all be creative! and use positive affirmations as part of your daily life. Reiki therapy is a form of hands on healing techniques developed in Japan by Dr. Mikao Usui. Reiki hand positions are applied in certain areas of the body and promote healing and deep state of relaxation. I would recommend treating yourself to a Reiki session every now and then to help your body clear out negative energy from your energy field. You can also learn Reiki and ado it to yourself while mentally saying positive affirmations to support your fertility and your wellbeing. Reiki is based on the chakra energy system the surrounds your body and organs created by the main seven chakras energy centers located in proximity of the seven endocrine glands. The Reiki energy balances and purifies these seven energy centers to eliminate stagnant and negative energy left behind by your fearful thoughts and negative feeling like anger, apathy, self-pity, self-reproach, sadness, irritability, etc. Once your energy system is renewed your physical system and endocrine system will also benefit a great deal. Each morning as you awake, you have the opportunity to begin your life anew. Remember you are unique and the events in your life are unique, when the time is right for you, things will happen, just continue to have a positive attitude and never lose hope." Stress and Fertility problems often go hand in hand. So, do not under estimate how dangerous your stress levels can be on your ability to conceive. If you like positive affirmations for fertility and conception, you are going to love this amazing Natural Cycle Meditation Fertility Program, which was developed for trying-to-conceive women who feel the need to release stress and want to learn how to effectively meditate for fertility and conception and get pregnant faster. This mind-body program contains 28 unique audio meditations/15 minutes each to support you through your cycle. Women simply love that because they get the mental and emotional support they need. Each meditation is designed specifically to match what's happening in your body during that day in your cycle using the most cutting edge knowledge of mind/body techniques to empower your ability to conceive. I cannot stress enough how important this is. Many women conceive simply by doing this easy daily meditation after years of trying. It is really amazing! If you feel under stress and need to know how to relax while trying to get pregnant, this program is for you. You will be gladly surprised!